After considerable political wrangling, Seattle struck a compromise: The aging Alaskan Way viaduct will be demolished and replaced with a surface level boulevard, and a $4 billion deep bore tunnel will be be constructed to accommodate traffic that now uses the viaduct. But traffic on the viaduct fell 44% from 2009 to 2012, leaving some to wonder if the tunnel is really needed. In the 1880s rail yards were built along Seattle’s waterfront to accommodate the City’s industrial needs. When use of the rails decreased, the City replaced them in 1953 with the double-decker Alaskan Way viaduct. Later renamed State Route 99, it became the major north-south thoroughfare in the city. In the 1960s, Interstate 5 was built through downtown Seattle. I-5 is the major north/south interstate highway on the West Coast, running all the way from Mexico to Canada along the Pacific Ocean. I-5 runs parallel to the Alaskan Way Viaduct downtown, about one mile to the east. Today I-5 carries about 250,000 vehicles per day, more than double the traffic on Route 99. Studies conducted in the 1990s revealed that the Alaskan Way viaduct was reaching the end of its useful lifespan. Daily wear and tear, increasing age, salty marine air, and damage by the powerful Nisqually Earthquake in 2001 all took their toll. The City of Seattle and the State of Washington agreed the viaduct must come down, but they wrestled for years over how to replace it. In 2007, a study by the University of Washington found that damage from continued post-earthquake settling would further undermine the structure. 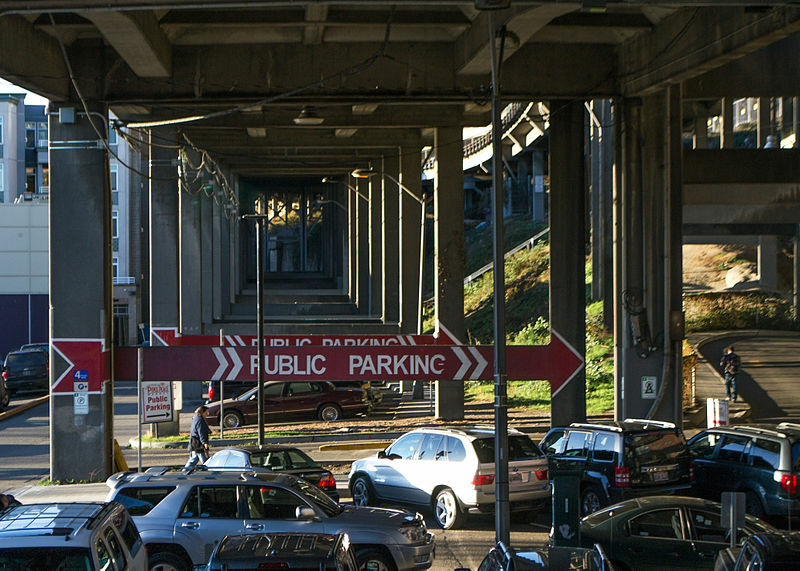 The study’s authors recommended the viaduct be taken down within 4 years. In January 2008, Governor Christine Gregoire announced that “no action” was not an option and by 2012 the viaduct must come down. At the time, however, no decision had been made regarding the viaduct’s replacement. A double-decker, cut-and-cover tunnel with three lanes in each direction. This option was favored by the city because it would open up access between downtown and the waterfront, and would also free up new property for development. The cost was estimated at $3.6 billion. State lawmakers objected to the cost of the proposed tunnel. They favored a new viaduct, built to current seismic standards, that would be larger and wider than the original. The estimated cost was $2.8 billion. Many prominent leaders and organizations opposed rebuilding the viaduct. They said this was a unique opportunity to reconnect downtown and the waterfront. Former Governors Dan Evans and Gary Locke, former U.S. Senator Slade Gorton, and the American Institute of Architects recommended against rebuilding the viaduct. In 2003-2004 Washington State DOT evaluated five options and decided that the six-lane cut-and-cover tunnel was the preferred alternative. Rebuilding the viaduct was retained as a backup plan. Disagreement between state and city leaders grew more intense. To settle the matter, a public referendum was held in March of 2007. Voters rejected both the cut-and-cover tunnel and rebuilding the viaduct. But there was another alternative being promoted by local leaders and groups, including former King County Executive Ron Sims, the People’s Waterfront Coalition, and the Congress for the New Urbanism. They envisioned the waterfront as a pedestrian-friendly neighborhood with a mix of commercial, retail, and public park spaces. Traffic needs would be addressed through improvements to existing streets, I-5, and public transit. It was said the plan would improve the tourist economy, create jobs, and encourage a denser and more residential downtown. The total cost of removing the viaduct, repairing the seawall, and improvements to I-5 and existing streets was unofficially estimated at $1.6 billion. In 2009, as debate continued, the state of Washington, King County, the city of Seattle, and the Port of Seattle revealed that they had agreed to replace the viaduct with a bored underground tunnel. 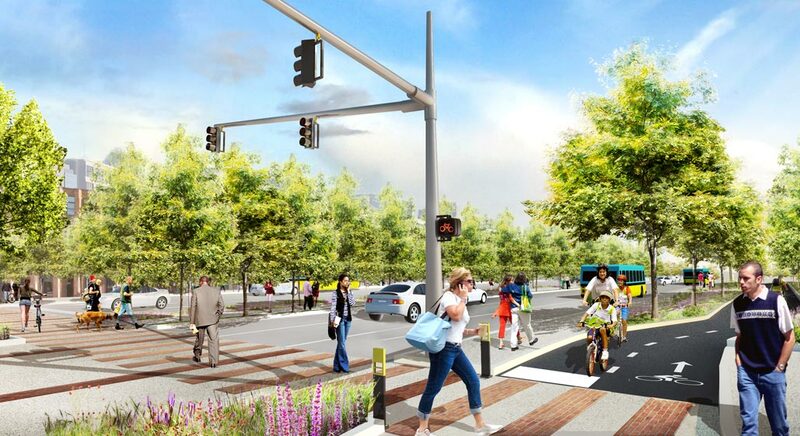 The approved design was four lanes, two miles long, and estimated to cost $4.25 billion. WSDOT would collect $200 million from tolls on tunnel traffic. The viaduct would be demolished and replaced with a surface road and public parks intended to link downtown and the waterfront. Rendering of the ground-level street that will replace the viaduct, opening up access between the waterfront and downtown. Source: city of Seattle. Drilling started in July of 2013 and was expected to take 14 months. In December problems were encountered and drilling stopped. In February 2014 it was found that seals in the massive drill had been damaged. Repairs were projected to take several months. Meanwhile, highway traffic figures revealed a surprising development. 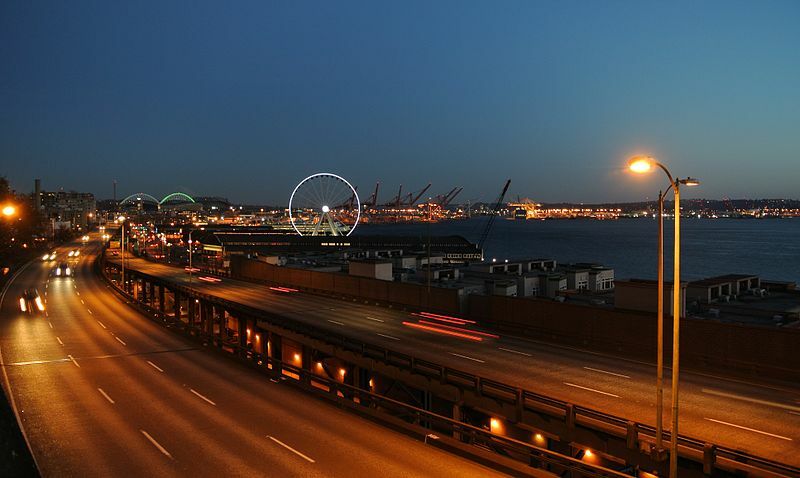 From 2009 to 2012 traffic on the Alaskan Way Viaduct had dropped by 44%, from about 110,000 vehicles per day to about 62,000. In anticipation of the viaduct being removed, traffic was already finding alternative routes. Some are now wondering whether the $4 billion tunnel is really needed after all. 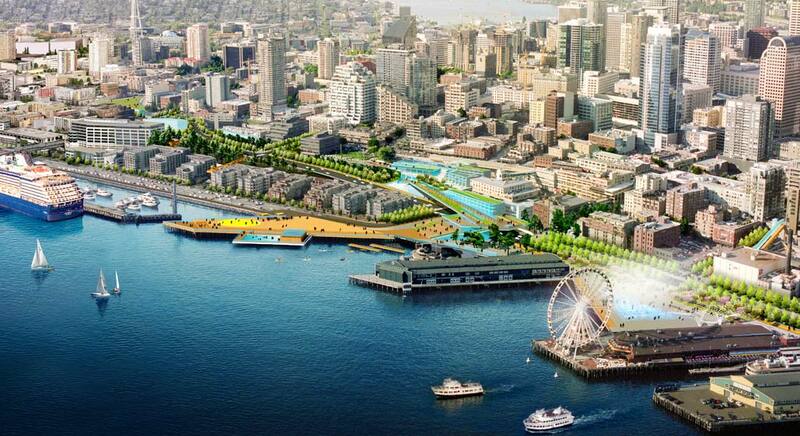 Rendering of ground-level street and bike paths that will replace the viaduct along the Seattle waterfront. Source: city of Seattle.